Save your staff time and money with The Loaded 6 Drawer Emergency Crash Cart™ from SimLabSolutions.com and DiaMedical USA. 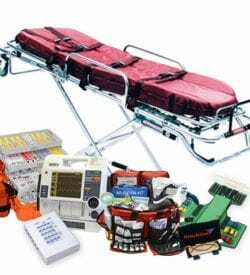 This 6 drawer Crash Cart is based off of ACLS guidelines and is stocked with all of the supplies and simulated medication recommended for teaching adult and pediatric advanced cardiovascular life support. You can re-order any tray to re-stock your cart and even custom order a tray with the specific items and medications you require. This Loaded Crash Cart™ is the perfect, hassle-free solution for code simulation!